With the new Project Online, Microsoft provides project managers and team members an improved tool for planning, collaboration and team communication. And that not only on-premises but also beyond the organization borders. 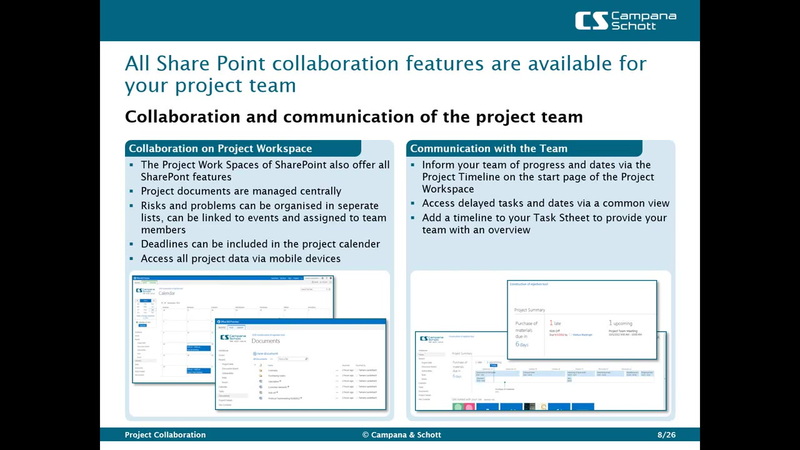 Through the tightened integration of Microsoft SharePoint and Project, the Project Team Site is the central point of communication – even external team members can be integrated easily. Markus Waldinger, Microsoft MVP and Manager at Campana & Schott, has more than 10 years of experience in Project Management and Social Collaboration. In this decade he has implemented Microsoft Project Server from version 2003 on and EPM based solutions within a variety of customers such as Bombardier, EADS or Bayer. Based on his proficiency he is responsible for the technical and functional evaluation of Project Server since 2010 and is leading the competence area EPM at Campana & Schott. Its main goal is gathering, managing and providing knowledge around EPM solutions across the whole company. Markus is part of the US team of Campana & Schott and also acts as a Virtual Technical Solution Specialist for Microsoft.